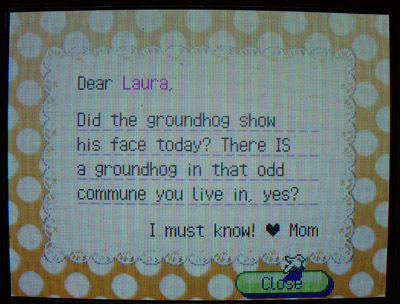 This letter from “Mom” showed up in my mailbox in Merriton while I was playing Animal Crossing this morning. Sadly, this letter could have been written by my real mother. She worries about how much time I’ve been spending in Merriton and talking to my animal friends. Ever since I started obsessively playing Animal Crossing back in October, I have been watching the weather on the little computer game televisions. I check it regularly so I can find out if it’s going to rain or snow the next evening. All of this obsession with the weather is focused on one thing, catching a coelacanth. Today, I was sick in bed with a sore throat, achy body and throbbing ears. 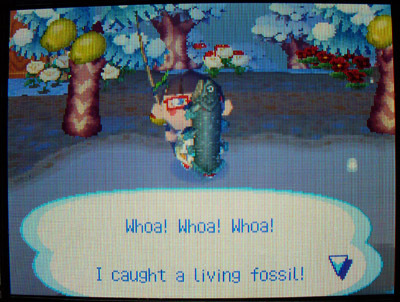 Since it was snowing, I started fishing after Coelacanth Time (4pm-9am). Finally, after hours and hours of fishing in the snow and rain, I caught one. I could have sold it for 15,000 Bells (that’s a lot of money), but I don’t need money. I would have paid 1,000,000 Bells to catch one or buy one from someone else. I donated it to the museum. 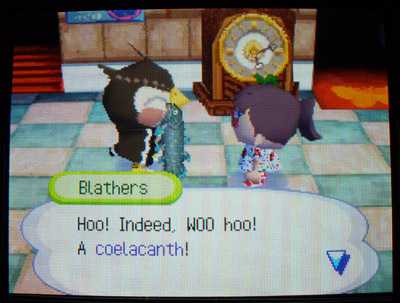 Blathers was happy to recieve it. The coelacanth is so rare that it was considered extinct until it a specimen was found in 1938. Since then, many coelacanths have been caught, but it is a rare fish. I love how the game teaches me about fish I would have never cared about in my daily life in Utah. 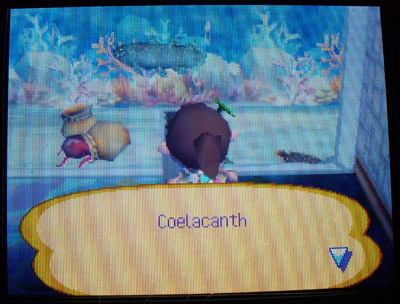 I’m 37 years old and I had never heard about the coelacanth until I found myself obsessively trying to catch one in a video game. I just woke up from a dream. I went to a beautiful performance art show. It was amazing! The theater was VERY small and intimate. It sat less than fifty people. The show was QUIET. It was amazingly quiet. Just beautifully quiet. The theater was in the round, so there were no seats any better than others. The first act started with a pool of water. The performers approached the water and put their feet into it. They made moises with the water that sounded like music. It was absolutely beautiful. It was kind of like STOMP but so silent and quiet that you would miss it if you weren’t paying attention. It was percussive and dance and all the lovely music came from the water. The second act had a patch of grass in the middle of the theater. They walked on the grass in time to create music. It was so quiet and beautiful. I was amazed that they could get the theater so quiet. It was such a lovely sound of people walking on the grass in the exact time to make music. Even though the music was being created with such different “instruments” you could tell that they were playing the same song on the grass as they had in the water. The third act involved one woman in the middle of the theater at a huge keyboard, not a musical keyboard, but a computer keyboard. She was typing and we could see what she was writing on the screen. The sound of her typing was a rhythmic tune, so she was creating this inspiring music again, but just with her fingers on a keyboard. There were intermissions between the acts while they changed the theater. Outside the theater, there were arts and crafts for sale: lots of colored glass hanging from metal curlie-cues. It was the kind of art that makes subtle noises like bamboo windchimes. Somehow, I think all the arts and crafts had to do with the show. Because the theater was so small, they were making their money on the souvenirs instead of the seats. After I woke up, I realized how difficult it would be to create this performance in real life. Each person allowed into the theater is a noisemaker and we don’t live in a society that rewards the quiet. You would need restrictions for people to even come into the theater: no cell phones, no pagers, no children under the age of 15, no talking, no one with any sort of sickness that would make them sniffle or cough. I think this sort of performance simply couldn’t work in today’s society without strict enforcement and bodyguards to evict people for even the slightest infraction. The whole idea of this performance is that music is everywhere around us. It is in the drips of water that come off the house and the soft padded steps of the cat across the carpet and in my fingers as I type this entry. Even now, I can feel the music in my fingers as I type this and my clicking is suddenly beautiful instead of a noise that falls into the background. I can hear the hard drive in the computer spinning as a backdrop to my typing and the world is beautiful. I’m surprised I haven’t talked about this online because it has been such a stress in my life. Right after Christmas, Mike and I realized that neither of us had seen Linda, our orange tabby cat all day. We tried the usual method of luring her out by opening the cheese drawer in the refrigerator and pulling out the cheese. Even opening up the package, calling her name and saying the word, “cheese” didn’t bring her out of hiding. We searched her favorite hiding places and found her under the bed sleeping. We pulled her out and she was lethargic and unwilling to eat, so we took her to the vet the next day. A blood test showed that she is in the early stages of kidney failure. She’s nearly fourteen years old, so this wasn’t a surprise to us. 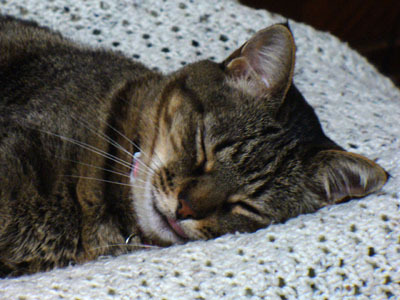 We almost lost Linda about ten years ago when she contracted Feline Infectious Anemia. She was lucky to survive it and we had both dealt with the idea of losing her back then. Every year we’ve had her since has felt like a gift and a surprise, so hearing that she might not be with us much longer hasn’t really hit us yet. She survived a nearly fatal disease so long ago. I almost believe she’ll be able to kick this kidney thing too. She is much better now. We have been feeding her K/D food. She hasn’t gotten dehydrated since then, but if she does, the vet taught me how to give her fluids subcutaneously so that she won’t get weak. 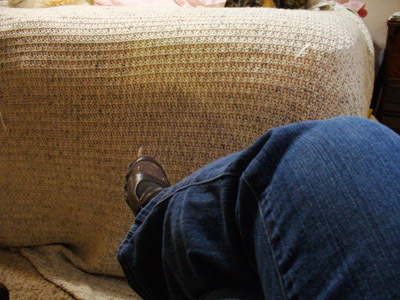 Sure, we have to change the kitty litter box more often than most people do, but that’s alright. It’s worth it to keep her around for a couple more years. The only disconcerting thing is that she is obviously looking for a place to die. Every time a cupboard is opened, she is investigating it. Every time we have opened the door to the small shelf basement, she has tried to get down there. She is looking for a hiding place that is better than her “under the bed” option, which obviously didn’t work last time. She was always a hider in times of stress. When we moved to the condo in Barrington Park, she somehow opened a drawer, crawled out of the drawer and into the back area of the cabinet. She hid there for hours while we frantically searched. We were only able to find her when she realized that she didn’t know how to get out and started meowing. Funny thing is, I’m a hider too. I prefer small, enclosed areas to work and relax. Small cubicles never bothered me. I used to do my school work in my closet at my parent’s home in West Valley. I put my desk in there with a light and I would close the closet door. It was the privacy I needed to study in a room I shared with my sister. 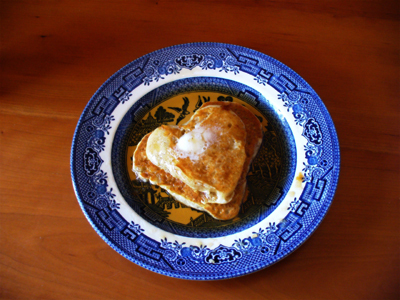 Last year for Valentine’s Day, Mike and I made these pancakes for ourselves. We didn’t use a fancy form or cookie cutter to make them, we just poured the pancake batter in two circles close together, then kind of played with them to make them heart shaped. It was a fun way to play with our food and such a good memory in my mind. I’m glad I took a picture. I’ve been working outside for the last couple of days. The laptop that usually accompanies me on trips and provides a slice of home in the hotel is being used on the patio table under the shade of the dark green umbrella. The heat from the sun makes my little computer smll nw again. Unfortunatly, th ‘s ar missing from vrything I’m typing. Non of th othr lttrs sm to b affctd, but is a prtty important lttr. That’s exactly how long you have to let Cap’n Crunch sit in milk before it’s edible. If you try to eat it before the mandatory five minute wait, then your palate will be torn to shreds unmercilessly. 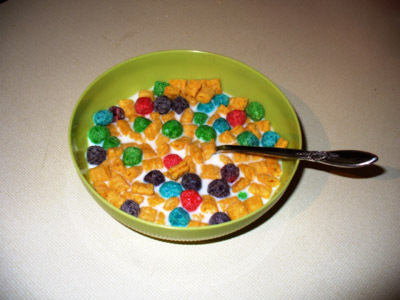 That’s exactly how long it takes Cap’n Crunch to turn into a mushy mess in milk. That gives you a one-minute window to eat your cereal. “It is?” I’m writing an entry about a brain-dead watch company that has made the world’s most stupid watch. I’ve never had a pair of tennis shoes that had glitter before. I can run really fast in these shoes because they are magically beautiful.